Part of the crisis we are facing today was caused by either deliberately hiding the realities of history, or by political activists distorting it to suit expedient politics and partisan ideologies. Distorted history indeed played a central role in dividing the Sinhala-Tamil communities on ethnic lines. One of the main thrusts of peninsular politics was to distort Sri Lankan history and polarise the two communities to keep them apart on ethnic lines. It began with G. G. Ponnambalam who launched his political campaign in the thirties by targeting the Sinhalese and their history. He became the champion of the Tamils by delivering a nine-hour lecture to the Soulbury Commissioners in which he blamed “the Sinhala government” for “discriminating” against the Tamils. Neither he nor any of his successors who held the leadership of Jaffna stood for any progressive, liberal, socialist, or pluralistic political programmes for peaceful co-existence. They survived in politics by rousing communal passions in Jaffna against the Sinhalese. The usual litany of complaints against the Sinhalese, which began with Ponnambalam, was dismissed by the Soulbury Commissioners as stuff and nonsense, unsubstantiated by the available evidence. But this did not stop him from attacking the Mahavamsa and Sinhala history. It is his distortions of history that caused the first Tamil-Sinhala riots in Nawalapitiya in 1939. His Sinhala rival, S. W. R. D. Bandaranaike, thanked him for giving a boost to the newly formed Sinhala Maha Sabha which was established to counter anti-Sinhala racism. 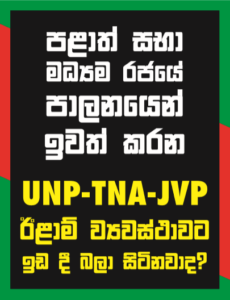 Since then the anti-Sinhala racism of Jaffna politics has been the regular diet fed to the people of Jaffna. It the scapegoat on which Jaffna politicians have been riding, partly to cover up their political sins of treating their own people as pariahs unfit for human society and partly to demonise the Sinhala-Buddhists – the indispensable political tool used consistently to gain political mileage both domestically and internationally. A common feature of Jaffna politics is the refusal to assess Sri Lankan history objectively without looking at it through the coloured lenses of either Ponnambalam, or S. J. V. Chelvanayakam. The ultimate expression of anti-Sinhala racism was enshrined as the official history of Tamils in the Vadukoddai Resolution of 1976. Subsequently, it became the standard reference point for academics, NGOs pundits, researchers, social scientist and the whole caboodle of pro-separatist, or pro-devolution ideologues. Any factual or objective analysis of history that goes counter to the authorised version of Tamil politics throws the Jaffna Tamils off balance. Schooled essentially in the locally manufactured history they are utterly confused when confronted with any critical / scientific / objective history that questions the hand-woven history that were rolled out like home-made beedi for popular consumption. Scholars, however, are not unanimous about the Vadukoddian version of mono-causal history, its geography, or its anti-Sinhala-Buddhist ideology that led the Tamils all the way to Nandikadal. The post-Vadukoddai image of Jaffna does not conform to the recorded facts in history. Besides, claims and counter-claims have obfuscated the history misleading the followers into paths of suicidal violence. For instance, the first known settlement of migrants of S. India which began in the thirteenth century in Jaffna is labelled by scholars under different classifications. Some say its a kingdom and others refer to it as a principality or as a feudatory. The combined geographical boundaries of the north and the east, which they claim to be their exclusive domain, have no historical basis nor demographic justification (there are more Tamils living with the Sinhalese than in their so-called “homeland”), except that they were drawn by the British who centralised the administration by dividing it into regional provinces. The Sinhala kings in the south, however, considered themselves to be the overlords of the entire island. It is in keeping with this doctrine that the King of Kotte ruled Jaffna with Sapumal Kumaraya (aka, Sembaperumal), his general, as the resident ruler of Jaffna. “So supreme seemed to be their success that the Kandyans even “tried to collect taxes”. This was the highpoint of the invasion. The Kandyans had advanced right up to the Jaffna Fort, the enemy’s innermost defences and encamped before it on the Pachellpallai plain.” – p.276, Kandy Fights the Portuguese, The Military History of Kandyan Resistance, C. Gaston Perera’s, Vijitha Yapa Publications, 2007.) Senarat’s claim to the Jaffna kingdom was strengthened by the marriage of his two sons to the Jaffna princesses in Tanjore against the wishes of the Portuguese who feared that a marriage alliance between the two kingdoms would be a certain threat to their security and stakes. After Jaffna was handed over to the Portuguese un der the terms of the Nallur Convention, the people of Jaffna were oppressed cruelly by the occupation army of the Portuguese. Naturally, they rallied behind the invading Kandyan forces and went on the rampage, burning the hated symbols of Portuguese Churches. The triumphant Kandyan forces were emboldened by the mass support of the population. After the defeat of Sankilli II in 1619 the people of Jaffna were happy to accept the Sinhala forces (in 1629) as liberators. Fr. Bruno wrote that the Kandyan army “was joined by the whole kingdom.” (Fr. V. Perniola, The Catholic Church in Sri Lanka, Portuguese Period. ) So technically, legally, politically and militarily Senerat established himself as the last king of Jaffna by taking over power from the Portuguese in the last battle for Jaffna. His invasion of Jaffna, his conquest of Jaffna, grabbing power from the Portuguese, his being in total command of the territory, his imposition of taxes and, above all, the mass support he got from the people of Jaffna makes him the legitimate and acknowledged king of Jaffna. The invasion and capture of Jaffna by Senerat blasts the politico-legal myth that the sovereignty of Jaffna was passed on to the Portuguese by the last king Sankilli II of Jaffna and, therefore, the British should have handed back sovereignty to his descendants, the Tamils. But history records that the last king of Jaffna was Senerat, a Sinhala-Buddhist King of Kandy, and not Sankilli II, though he was last king of Aryachakravarti dynasty. As Senerat was the last king to fight the last battle over Jaffna there could be no doubt that sovereignty passed over finally from the Sinhala king to the Portuguese. The conquest of Jaffna by Senerat’s forces in 1629 negated the validity of the Nallur Convention in which Jaffna handed over power to the Portuguese in 1619. The fate of Jaffna was settled finally in “last battle” fought by Senerat and not at the Nallur Convention. When Mudliyar Attapattu was holding Jaffna the Portuguese general Constantine de Saa had to send two columns from the south to challenge him and regain Jaffna for the Portuguese King. Even though Mudliyar Atapattu held Jaffna for a brief while, history records that sovereignty finally passed over to the Portuguese only after the defeat of Mudliyar Attapattu on Jaffna soil. The victory of Mudliyar Attapatu makes Senarat the last king of Jaffna. And the defeat of Mudliyar Atapattu establishes that sovereignty was regained by the Portuguese only after defeating him. There is serio-comic irony in this historical event : the last King of Jaffna was a Sinhalese and the last king of the Sinhalese was a Tamil. Such are the twists and turns of history which mock the pompous racial assumptions of extremists. Accepting the historical truths as recorded by reliable eye-witnesses is indispensable to draw accurate conclusions from history. The pro-Tamil lobby had laboured indefatigably to comb every nook and corner of history to extract evidence to prove that Jaffna belongs to them exclusively. One of the main arguments is based on the Nallur Convention in which they claim that power was handed over by the Tamils to the Portuguese. From this point they trace a line of power flowing from Tamils to the Portuguese and from Portuguese to the Dutch and from the Dutch to the British. From this chain of events they conclude that the British should have handed over power to them instead of handing it over to the Sinhalese because it was the Tamils who handed over power to the Portuguese. But the historical events, as recorded by the Portuguese historians, confirm that the Sinhala King recaptured Jaffna and the decisive and final transfer power took place only after the Portuguese reclaimed Jaffna by defeating the Sinhala forces. So the ultimate transfer of power took place when the Sinhalese lost Jaffna to the Portuguese in the last battle for Jaffna in 1629 and not when the Tamils lost it to them in 1619. The Nallur agreement signed with the Portuguese has no relevance to the transfer of power because after the conquest of Jaffna by Senarat the Nallur Agreement had no validity under the new political dispensation of the Kandyan King. The conquest of Jaffna by Senerat superseded the previous arrangements with the Tamil kings. As the last king of Jaffna it was his word that reigned supreme in the destiny of Jaffna. This emphasizes the prime necessity of establishing historical truths to prevent falsifications of history and, more importantly, to trace the proper sequence of events without hiding relevant historical facts for political gain. The validity of the Tamil claim to a separate state based on their argument that sovereignty of Jaffna was passed over to the Portuguese by the Tamil king loses legitimacy and credibility when tested against the eye-witness records of the Portuguese historians. A nation does not deserve to be divided on fictitious history. This was written in 1803 by R. Perceival in his book, An Account of the Island of Ceylon, (London 1803, pp. 114-115). What is striking in Perceival’s report is the absence of Tamils in this account. The absence of a racial group established as Tamils from the early colonial records is puzzling. However, it is wrong to conclude that the Tamils were not there. Even the Mahavamsa records the prevalence of the Tamils (Demalas). The reference to Tamils comes into prominence mainly in the British records of the late 19th century, particularly after the censuses which classified the people according to races. The Portuguese and the Dutch classified them essentially as Malabaris. In the early colonial periods, however, the influx of S, Indian migrants from Malabar and Travancore must have overshadowed the native Tamils. Besides, the “Tamil consciousness” which rides high, overdetermining current politics, could not have been in existence in the early colonial periods. As shown earlier, the records do not even recognise Tamils as a communal entity. The rise of Tamils as a political force, driven by the Saivite-casteist forces forged in its insular past, is clearly a post-British phenomenon. This development has a history of its own which has to be explored more thoroughly to disentangle the interweaving threads of north-south relations that worsened inter-ethnic relations. The rise of “Tamil consciousness”, in its most virulent form, emerging from nowhere, as it were, has been a decisive factor in the 20th century and, oddly enough, our social scientists have ignored this aspect in analysing the Tamil past that went awry.